We take our hats off to the people, worldwide, who have been leaders in the development of railway safety in the nineteenth century and how these pioneers progressed against all odds in an uncharted territory. Stephen E. Ambrose in his book 'Nothing like it in the world' has described the conditions of travel in the first decades of railway's existence in the United States. He mentions that they were rickety, running on poorly laid tracks making travel a bone-shaking experience. The carriages were too hot in summer and much too cold in winter (except when nearest to the heating stove, where it was too hot). The boiler in the engine was fired by wood, generating sparks, which flew back into a carriage and sometimes set it on fire. Bridges also could catch fire and burn. Accidents were common, killing and wounding passengers. The locomotives put forth much smoke making the travel uncomfortable. In the beginning when there were no telegraphic communications, train operations followed a fixed timetable. As speeds were slow, this system sort of worked, with few accidents. Difficulties were felt in ascertaining the position of trains when they were late due to breakdowns or other causes. Special emergency measures and relief parties had to be kept ready for such contingencies, to find out cause of the breakdown. It could be a derailment or an engine failure. With the introduction of telegraph, it became easier to establish communications with staff stationed at shorter intervals. At that time there were no signaling systems to inform the driver that the line ahead was clear. Gradually learning from experience the present method of signaling was adopted. Automatic signals and automatic train controls were later developed and we are now progressing towards instant communication with the driver and others responsible for train operations. Centralized traffic control has been introduced and continuous progress is being made in making rail travel safer. Another cause of accidents was defective brake power. The start was made by providing brakes on the engine and later brakes were provided on railway carriages, which were operated by men traveling on each carriage. In course of time, vacuum brakes were introduced, followed by power brakes, able to stop the trains in shorter distances. But with the increase in the loads and the speeds of trains, it still took time for a moving train to stop. The introduction of Air Brakes made a big difference in this direction. For night travel, there were no head lights to guide the driver. In the absence of a head-light, on one railway in America an open platform car was provided in front of the locomotive, a fire of pine knots, surrounded with sand, which furnished the requisite illumination of the route to be traversed. Thereafter, improvements continued and now we can see the strong head-lights provided to guide the driver of the condition of the track ahead. To avoid train derailments on account of cattle crossing the track, cow catchers were provided on the locomotives. There were derailments on account of hot axles, which were controlled by providing roller bearings. This gives us an idea as to how progress has been made with the passage of time. John H.White, Curator of Transportation for the U.S. National Museum, in the preface of the book 'Train Wrecks' by Robert C.Reed (Bonanza Books, 1968) writes, "Although accidents began with the first railroad operations in this country, the early years were generally free from serious disasters. Light traffic and slow speeds account for this good early safety record. By mid-century, however, the enormous growth of the rail network and the corresponding growth of traffic together with the introduction of night-time travel reduced the margin of safety considerably. Primitive signaling systems, laminated iron rails, and brittle cast iron wheels contributed their hazards of railroading in this country. But as always human error was the main cause of accidents. It might be suggested here that the public outcry against the dangers of rail travel took a vengeful personal note compared to the fatalistic acceptance of road and sea disasters that were somehow considered as natural calamities. Late in the nineteenth century, a number of important technical inventions combined to improve the safety of rail travel. Cheap steel brought sound rails, axles, and bridges. Automatic electric signals, double track, and the Westinghouse brakes made their contributions. The fire hazard was banished by the adoption of electric lighting and steam heating about the turn of the century. All of these efforts were culminated by the adoption of the all steel passenger car in 1907. Today railroads are the safest mode of travel available to Americans." The Indian Railways have also made continuous progress in improving railway safety since the start of the first railway train between Bombay and Thana in 1857. Satellite communications have been introduced to optimize train operations and enhance levels of safety in the high-density track route sections. Mobile train radio systems have been adopted over the 1700 kilometer route on the Itarsi-Bhusaval, Itarsi-Nagpur, Durg-Nagpur and Delhi-Mughalsarai sections, for communication between the driver and the guard in case of major technical problems or emergencies and to warn other trains in the area of any likely dangers. Whenever a serious accident takes place resulting in heavy causalities, it naturally agitates the public mind and there is a hue and cry from all sides that steps should be taken to prevent such tragedies. The question arises as to who is responsible for the accident and how such accidents can be avoided? As accidents have been taking place ever since the introduction of rail travel and repeated efforts have been made all along to eliminate them. An accident is usually caused by a number of factors. Sometimes it may be a failure of a single person, or of a single piece of equipment. On other occasions, it could be a combination of factors. 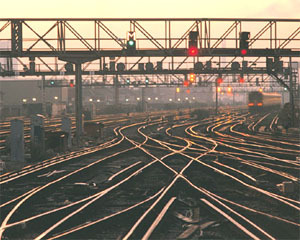 The accident could have resulted from sabotage, or negligence of people not connected with railway operations, or it may be due to the mental stresses and strains under which an individual employee may have been working when performing his duties. The science of accidents and their causes is so complex that it often becomes difficult to pinpoint or generalize in fixing responsibility on an individual or a group of individuals. It is difficult to say at any stage that we have reached the final goal of zero accidents, just as in the medical field we cannot say that there will be no disease although we have come a long way in making life safer and healthier. Preventing accidents and making rail travel safe is a continuing process which has to be pursued with all vigor. This is the objective of all those responsible for the operation of Railways as well as the Commission of Railway Safety. It must, however, be appreciated that the Indian Railways employ over a million people for their operation, and a small slip on the part of one of them could cause a disaster. It is, therefore, necessary that instead of blaming the railway organization, various factors which cause accidents are analyzed and steps taken to eliminate them on a systematic basis. It needs to be emphasized that it is important to take steps to reduce the growing lawlessness in the country. The vast areas through which the railways run and other factors in which it is not possible to isolate the railway tracks from outside interference, it becomes difficult for the railway organization to have full control over the integrity of the track. Malicious interference with railway operations such as removal of fish plates, cutting of rails, blowing of bridges, theft of railway property such as signaling equipment, and carelessness in crossing railway tracks have resulted in many serious accidents. To understand how railway travel has developed as the safest form of travel, one needs to take a brief look at the development of Railway travel through the centuries. Roads of rails called Wagon-ways were being used in Germany as early as 1550. These primitive rail roads consisted of wooden rails over which horse-drawn wagons or carts moved with greater ease than over dirt roads. Thus Wagon-ways were the beginnings of modern railroads. By 1776, iron replaced the wood in the rails and wheels on the carts. Wagon-ways evolved into Tram-ways and spread though out Europe. Horses still provided all the pulling power. In 1789, An Englishman, William Jessup designed the first wagons with flanged wheels. The flange, a groove that allowed the wheels to better grip the rail, was an important development that contributed greatly to future railway safety. Further progress became possible due to the invention of the Steam Engine by James Watt, towards the end of eighteenth century. In 1803, it was proposed to convert the horse-drawn tram-ways and make them steam powered. George Stephenson is said to have designed the first steam locomotive for railways in 1814. In September, 1825, the first railway service with a steam locomotive was run with goods and passengers on regular schedules. For American Railroads Col. John Stevens is said to be the father. In 1815 he was given the first railroad charter and in 1826, he demonstrated the feasibility of steam locomotion on a circular experimental track constructed on his estate in Hoboken, New Jersey, three years before George Stephenson perfected his steam locomotive with the development of the Rocket. It is also worth noting what National Railway Museum have recorded about safety. They say that, like most endeavors, the early years of railroad development were years of experimentation. Emphasis was on developing the machines and the system. Safety was not so much a concern as the speeds were slow. Prior to 1850, railways were considered to be as safe or even safer than any other mode of travel. But in 1853, on account of a series of accidents, resulting in large number of deaths, attention was focused on the safety aspect. There were a variety of issues that needed to be addressed: better engineering for bridges and track, better methods of communications, traffic control, safer brakes and improved couplers. The last two were specially important to railroad safety. George Westinghouse invented the air brakes in 1869 when he was 22 years old but it took several years to perfect the system and several more to convince the management of their effectiveness. The adoption of the automatic couplers, similarly took time to be perfected and widely accepted. In the 1960's and early 1970's, considerable interest developed in the possibility of building high-speed trains that could travel much faster than conventional trains. From the 1970's, interest in an alternative high-speed technology centered on magnetic levitation, or mag-lev. This vehicle rides on an air cushion created by electromagnetic reaction between an on-board device and another embedded in its guide-way. High-speed magnetically levitated ground transportation (mag-lev) is a new surface mode of transportation in which vehicles glide above their guide-ways, suspended, guided, and propelled by magnetic forces. Magnetic levitation (mag-lev) is a relatively new transportation technology in which non-contacting vehicles travel safely at speeds of 250 to 300 miles-per-hour (112 m/s to 134 m/s) or higher while suspended, guided, and propelled above a guide-way by magnetic fields. Work on the safety of very high-speed railway continues with the use of fully-automated computer-controlled systems. In this book, we have tried to highlight different types of accidents and their root causes. We have also attempted to show the lessons that have been learnt from these accidents, and how these lessons have been applied to preventing future accidents. There is a constant striving towards the all important goal of zero accidents . Thus it will be seen that Achieving maximum railway safety is no accident!